Signs and posters, snapped around NYC. Check out all the other Ruby hunters, here. I like the first one a lot but I really love the last one. You've left us guessing what the ad is for. Isn't it interesting how often red is used in advertising? Cool shots! Red really gets our attention. 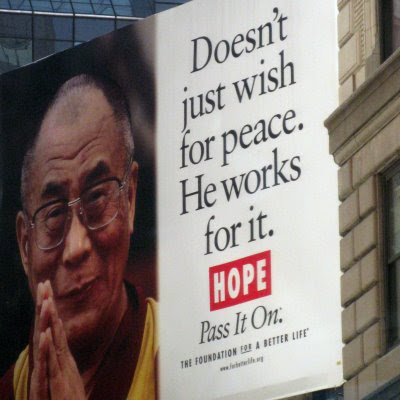 Even the Dalai Lama uses it! I wonder, too, what the last poster is for. I guess we have to have the signs and posters and they are colorful.. but somehow, I wonder if we miss all the beautiful architecture in NYC because of them. you wish there was more! Read somewhere that vibrant colors are extensively used in graphic ads. Not surprising as they really attract attention. Nice captures! My Ruby Tue is up.